When I ran out of film in Barcelona a few weeks ago, I decided to make use of the out-of-date WallMart film that I found in the bottom of the shoebox that my second-hand camera came in. 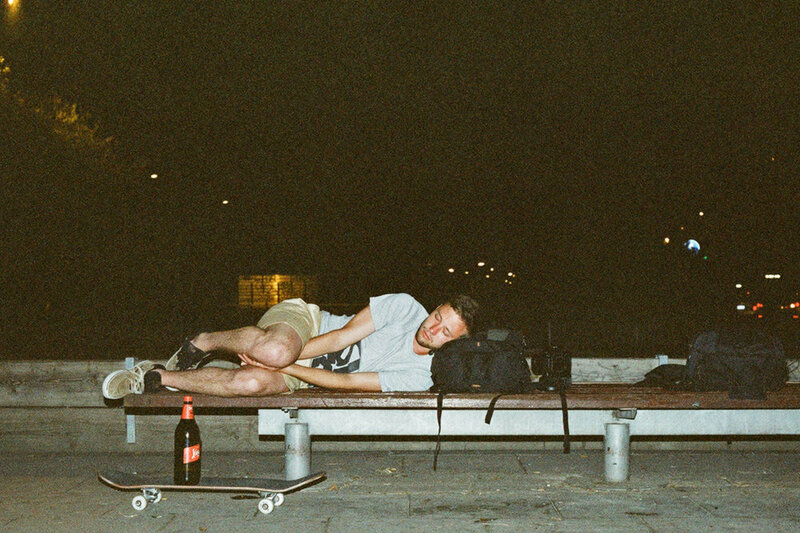 I didn’t expect much out of the cheap 200iso roll, especially since I’d used up most of it walking down Las Ramblas after one too many cervezas, and as such, I didn’t rush to get it developed before writing my previous post. Having picked up the film yesterday, however, I was pleasantly surprised by one or two of the shots. Our final day in Barcelona was spent on the beach, where we found a few second to relax in between the plethora of locals selling coconut, mojitos, sun hats, sunglasses, massages, beer, fanta, henna tattoos cigarettes and hashish. En route, Dave disguised himself as a tree and planted a fs feeble on some tight banks. The previous day had been one of our most productive, with Matt and George pulling out the stops at spot we stumbled on at the end of a lengthy session. By piggybacking on Zach’s flashguns, I was able to capture George chomping four of Barcelona’s newest and most untapped blocks.